North Carolina Psychologists have an upcoming license renewal deadline of September 30, 2018. Licensees must complete a minimum of 18 continuing education (CE) hours over each two-year renewal period. A minimum of 9 hours must be in Category A programs or activities, which must include 3 hours in the area of ethical and legal issues in the professional practice of psychology. 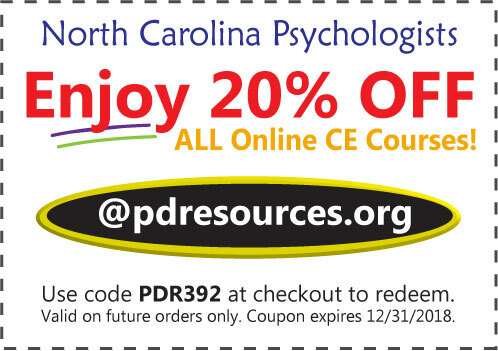 Click here to view APA-sponsored online CE courses. Is the program sponsored or co-sponsored by the Board, the APA, an APA-approved sponsor, or by NC AHEC? Does the program specifically identify psychologists in the target audience? Are contact hours specified by the sponsor? Does the program meet the topic areas specified in paragraph (g) of the Rule? Does the program provide a certificate upon completion? If a licensee can answer “Yes” to all of the above, the activity would be acceptable for Category A hours. If even one of the five questions is answered in the negative, the activity does not meet the requirements to count for Category A hours. There are no sponsorship requirements for Category B activities; however, a psychologist must be able to show that the activity either covers ethical and legal issues in the professional practice of psychology, or assists him/her in maintaining and upgrading skills and competencies within his/her scope of practice. While it is not required that licensees complete any Category B hours (all hours may be completed in Category A activities), one may count up to nine hours of Category B credit toward the required eighteen hours total. Our online courses provide instant access to the course materials and CE test. Successful completion of the online CE test (80% required to pass, 3 chances to take) and course evaluation are required to earn a certificate of completion. Click here to learn more. Have a question? Contact us. We’re here to help!